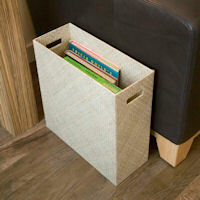 Ideal for bulk storage of those heavy Sunday papers and other magazines. 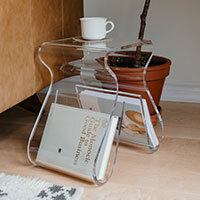 Karim Rashid designed acrylic stool/side table with integrated magazine rack / LP storage. 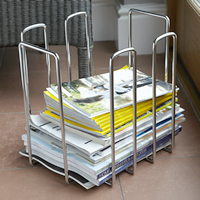 Stylish, minimalist raw oak magazine rack with plenty of storage space for all those weighty Sunday newspapers. 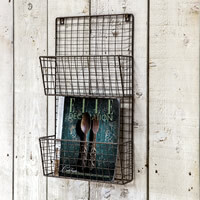 Wirework wall mounted magazine rack to keep magazines, periodicals and newspapers in check. Top quality solid oak and leather magazine rack. Perfect for popping next to the couch or your favourite armchair. 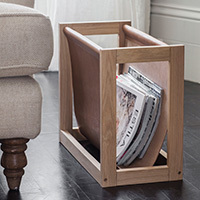 Useful and stylish mid-century side table with integrated magazine / newspaper storage rack. Great for use in the living room at the side of the couch. 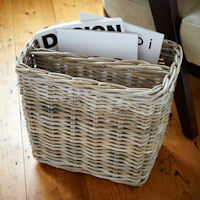 Chunky grey wicker magazine storage basket to complete that country cottage look! 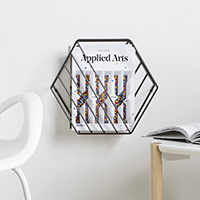 Mid-century inspired white wire and wood side table with integrated magazine rack. 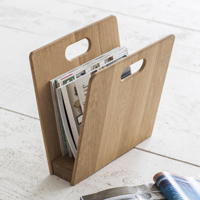 Generously sized and top quality, our handcrafted beech magazine rack has two storage compartments and an integrated carry-handle.